Osteoporosis | Infonet Biovision Home. Osteoporosis is a condition in which the bones become fragile and brittle, leading to a higher risk of fractures (breaks or cracks) than normal bone. Osteoporosis occurs when bones lose minerals such as calcium, and the body cannot replace these minerals fast enough to keep the bones healthy. As a result, bones become thinner and less dense. Osteoporosis is almost as common as high blood pressure, and is more common than high cholesterol. Any bone can be affected by osteoporosis, but the most common sites are bones in the hip, spine, wrist, ribs, pelvis and upper arm. Osteoporosis has no signs or symptoms usually until a fracture occurs - this is why osteoporosis is often called a silent disease. Fractures due to osteoporosis are known as osteoporotic fractures. These can lead to changes in posture (eg. developing a stoop or Dowager's hump in your back), muscle weakness, loss of height and deformity of the area affected. Fractures can lead to long-term pain and disability, loss of independence, and may even contribute to premature death. Bone is made of collagen fibers (tough, elastic fibers) and minerals (gritty, hard material). Bone is a living tissue and contains cells that make and mould bone. After about the age of 45, you begin to lose a certain amount of bone. This leads to a gradual "thinning" of the bones (bone loss). The amount of bone loss can vary. If you have a lot of bone loss, then you have osteoporosis. If you have osteoporosis you have fragile bones which can break easily and often. There is no cure for osteoporosis, but it is treatable with drugs that reduces your chances of getting a fracture by increasing your bone density and helping prevent the progression of osteoporosis. Women suffer bone loss about three times more than men. This becomes worse after menopause when the levels of oestrogen begin to fall. Oestrogen is a female hormone and has a protective effect against bone loss. By the age of 70 some women have lost up to 30% of their bone. About 1 in 3 women and about 1 in 12 men over the age of 50 will fracture a bone as a result osteoporosis. Are past menopause, when the level of oestrogen falls. This is particularly so if you had an early menopause (before the age of 45), or had your uterus removed (hysterectomy) before your menopause. Have had a bone fracture after a previous fall or bump. Have had long periods of dieting, especially if you suffered anorexia nervosa or bulimia. In these situations, the level of oestrogen is often low for long periods of time and combined with a poor diet, can affect the bones. Have done excessive exercise, such as regular marathon running. Excessive exercise in some women causes a low level of oestrogen and their monthly periods may stop. However, moderate exercise is good (see below). Have used, or are using, a steroid medicine (such as prednisolone) for three months or more. One side-effect of steroids is bone loss. Have had irregular menstrual periods for whatever reason. Smoke or drink a lot of alcohol. Do not receive adequate calcium or vitamin D.
Never performed regular exercises, or have led a sedentary lifestyle. Have, or had, certain medical conditions which can affect the bones. For example, an overactive thyroid, Cushing's disease and any condition that causes poor mobility. 1. A bone fracture after a minor injury such as a fall. If you have osteoporosis, the force of a simple fall to the ground is often enough to fracture a bone. (A simple fall to the ground from standing does not usually cause a fracture The fractures are most commonly of the hip, wrist, and vertebrae (the bones that make up the spine). A fractured bone in an older person can be serious. About half the people who fracture their hips, are unable to live independently afterwards. 2. It is estimated that about 1 in 3 people over the age of 65 have a fall each year, increasing to 1 in 2 people aged 80 years and older. Over 85,000 people have a hip fracture each year in the UK, and about 19 in 20 of these are the result of a fall in those who have osteoporosis. 3. Loss of height, persistent back pain and stooping (bent forward) These symptoms occur if you develop fractured vertebrae which become "squashed" with the weight of the body. Vertebrae in those with osteoporosis may fracture even without an injury. Special X-ray machines which do a Dual Energy X-ray Absorptiometry (DEXA) scan can check the bone density (thickness) and confirm osteoporosis. You may be advised to have a DEXA scan if osteoporosis is suspected, or if you are at high risk of developing it. However, osteoporosis is often first diagnosed when you break a bone. The following helps to prevent, or at the very least slow down, bone loss. This advice applies to everyone. It is, however, particularly important if you have an increased risk of developing osteoporosis, or already have it. Regular weight-bearing exercise throughout life is best, but it is never too late to start. This means exercise such as brisk walking, aerobics, dancing and running. For older people, a regular walk is a good start. Exercise helps because the pulling and tugging on the bones by the muscles helps to stimulate bone-making cells and strengthens the bones. It also gives strength to the supporting muscles around the bones. This helps to increase tone and balance which may help to prevent you from falling. Note: excessive exercise such as marathon running may not be so good. Take care to eat more foods that are rich in calcium and vitamin D. Research has shown that people who eat 1000 mg of calcium each day have a reduced risk of hip fractures. Ask for advice about diet. Eating 60 g (2 oz) hard cheese such as Cheddar or Edam, or one pot of yoghurt (125 g), or 60 g of sardines. Whole meal bread and calcium fortified soya milk are also good sources of calcium. Butter, cream and soft cheeses do not contain much calcium. Dietary supplements of calcium/magnesium and/or vitamin D tablets may be advised by your doctor if you do not get enough in your diet and are at an increased risk of developing osteoporosis. A dietary supplement of vitamin D is recommended for all people over the age of 65. Chemicals from tobacco are absorbed into the bloodstream and can affect the bones and make bone loss worse. If you smoke, make every effort to stop. Also, cut down on alcohol if you drink heavily. Hormone replacement therapy includes replacement of hormone oestrogen. Long-term therapy may help to prevent bone loss. However, there are some associated health risks, particularly in relation long-term use. For that reason, it is not commonly used to prevent osteoporosis. Various medicines are available. Medication is advised if osteoporosis is confirmed, also if you are at high risk of developing osteoporosis. For instance, an individual aged over 65 and taking steroids long-term. Once medication for osteoporosis is started, it is likely that you will need it for the rest of your life. The Bisphosphonates are a group of medicines which include ibandronate, alendronate, risedronate and etidronate. 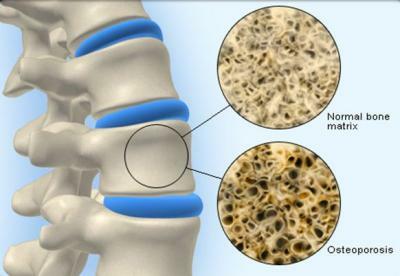 These are the most commonly used medicines to treat osteoporosis. They work on the bone-making cells. They can help to restore some lost bone and help prevent further bone loss. Research studies have shown that the risk of bone fracture is reduced by taking one of these medicines. Calcitonin, Raloxifene and Strontium Ranelate are medicines that are used only if a bisphosphonate is not deemed suitable. They too are supported by research evidence that shows they can help reduce the risk of bone fractures. Hormone Replacement Therapy is an option if other treatments are unsuitable. Parathyroid hormones are being used as a new treatment for osteoporosis. Its role is not yet fully established but it may become more widely used in the future. 2. Calcium/Magnesium and vitamin D tablets. These dietary supplements are commonly prescribed in addition to one of the above medicines. The body needs plenty of calcium and vitamin D to make bone. Medication will not restore all lost bone. Therefore, in addition to medication, lifestyle changes (diet and exercise) play a key role in recovery. You can take measures to help prevent you from falling. This can reduce the chance of you breaking a bone. Check your home for hazards such as uneven rugs, trailing wires, slippery floors, etc. Regular weight bearing exercise may help prevent falls (as described above). Is your vision and/or hearing good? Do you need prescription glasses or a hearing aid? Do you take medicines that make you drowsy? Can they be changed? If you have had a fall, or have difficulty walking, you may be advised to have a formal "falls risk assessment". This involves various things such as a physical examination, checking your vision, hearing and ability to walk as well as reviewing your medication and home circumstances. Following this, where appropriate, some people are offered things such as a muscle strengthening and balance programs, or recommendations on how to reduce potential hazards in the home. 1. Include calcium rich foods in your diet daily. Calcium helps build up strong bones and is found in dairy products such as milk, yoghurt or mala, cheese and green leafy vegetables. Also consume fish with bone such as omena and sardines as they are rich in calcium. 2. Base your meals more on plant protein as they are richer in fiber and low in fat. Adequate protein is important for prevention and management of osteoporosis. Beans, lentils, green grams and black eyed peas are examples of plant protein. 3. Vitamin D is also essential for good bone health. (It is produced by the action of sunlight on our skin and plays an important role in increasing the absorption of calcium from foods.) It is also found in eggs, cheese, green leafy vegetables and dates. 4. A high sodium diet interferes with the retention of calcium in your body. Reduce intake of fast foods and commercial snacks as they contain high quantities of sodium and have been linked to weak bones. This includes chips, crisps and hamburgers. 5. Diets rich in vegetables help conserve the calcium in the body by reducing its elimination. Increase the intake of vegetables in your diet. To help yourself achieve this, divide your plate into two and fill one part with vegetables, with the remaining quarter for starch and the last quarter for protein. 6. Eat 3 regular meals in a day with fruits as snacks in between. 7. Try adding a little soy products in your diet. Studies have shown that soy increases the formation of bone proteins which increase bone formation. 8. Limit the amount of coffee you drink in a day. Coffee contains caffeine which leads to calcium loss in the urine and increases the risk of hip fractures. Have at most 2 cups of coffee per day and also cut down on the amount of soft drinks you consume. 9. Reduce the amount of alcohol you consume to at least one beer a day. Alcohol has been associated with greater bone loss and women who drink more are at greater risk of osteoporosis and fractures if they already have osteoporosis. 10. Bone is a tissue that gets weaker without use but stronger with use. 30 minutes of moderate intensity exercise such as brisk walking, jogging or dancing daily is recommended. If you already have osteoporosis discuss with your doctor first before engaging in any exercise. Drugs for postmenopausal osteoporosis (2008). Treatment Guidelines From The Medical Letter, 6(74): 67-74. Jackson RD, et al. (2006). Calcium plus vitamin D supplementation and the risk of fractures. New England Journal of Medicine, 354(7): 669?683.